An Enterprise PaaS must truly be agnostic to the underlying elastic infrastructure, and fully support open standards. So the big question is whether the Pivotal Initiative will be able to break away from its roots with EMC and VMware and the associated ties to VSphere? Pivotal Labs: Besides the source of Paul Maritz‘s new company name, this is an agile software development consulting firm focused on Ruby on Rails, pair programming, test-driven development and behavior driven development. It is known for Pivotal Tracker, a project management and collaboration software package. OpenChorus: real-time social collaboration on predictive analytics projects, allowing businesses to iterate faster and more effectively. Cetas: End-to-End analytics platform from data ingestion, to data source connectors, to data processing and analytics, and visualization to recommendations. Vfabric SpringSource: Eclipse-based application development framework for building Java-based enterprise applications. Vfabric Data Director: Database provisioning, high availability, backup, and cloning. This product includes the ability to provision Hadoop on VSphere using open source project Serengeti (powered by the open source orchestration project Ironfan). Vfabric Gemfire: An in-memory stream processing technology that combines the power of stream data processing capabilities with traditional database management. It supports ’Continuous Querying‘ which eliminates the need for application polling and supports the rich semantics of event driven architectures. Vfabric RabbitMQ: Enterprise messaging middleware implementation of AMQP supporting a full range of Internet protocols for lightweight messaging— including HTTP, HTTPS and STOMP – enabling you to connect nearly any imaginable type of applications, components, or services. Greenplum: An ad hoc query and analytics database. The Greenplum database is based on PostgreSQL. It primarily functions as a data mart / analytic appliance and utilizes a shared-nothing, massively parallel processing (MPP) architecture. It has a parallel query optimizer that converting SQL AND MapReduce into a physical execution plan. Pivotal HD (Hadoop Distribution): The distribution is competitive with Cloudera. EMC (now Pivotal) created their own distribution so it could improve query response time (but this occurred before they were aware of the introduction of Impala. Many believe that Pivotal HD was created solely to boost struggling sales of its Greenplum software and appliances. Cloudfoundry: an open source cloud computing Platform as a service (PaaS) software written in Ruby. Bosh: an open source tool chain for release engineering, deployment and lifecycle management of large scale distributed services. It was initially developed to manage the Cloud Foundry PaaS, but as it is a large scale distributed application, bosh turned into a genreal purpose orchestration tool chain that can handle any application. It currently bosh supports four different IaaS providers: OpenStack, AWS, vSphere & vCloud. IaaS – OpenStack, AWS, vSphere & vCloud: Support starts with vCloud and VCenter APIs, and extends with later additions of OpenStack and AWS (via the Bosh orchestration layer). So when you look at this sample of technologies (and I’m sure I’m leaving many off the list), you might see through the EMC/VMware veil….to see a collection of open source projects. We’ll see how Paul Maritz pulls this all together – clearly a powerful number of teams and technology. 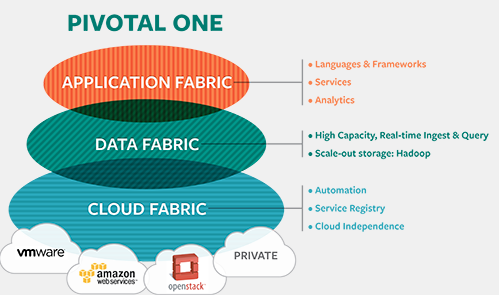 So why do I refer to VMware’s “fate”…well, it’s no secret that VMware’s business has begun to plateau under the pressure from open projects like OpenStack. Did Paul get out right in the “nick of time”? Can he create a long-term sustainable business on open source? Tagged with AWS, bosh, cetas, cloudfoundry, gemfire, greenplum, hadoop, openchorus, openstack, pivotal HD, pivotal initiative, pivotal labls, rabbitMQ, springsource, vcloud, vsphere. As you are a Cloud pioneer, we thought you might be interested in checking out the newest Cloud Management Platform application “ECmanaged”. ECmanaged is a pioneering multi-Cloud management tool that enables users to control and manage both Cloud platforms and applications as well physical servers through an integrated and intuitive dashboard. We are also proud that we have just been awarded “Best Cloud solution” by Eurocloud Spain and are among the 10 promising Cloud start-ups according to GigaOm. We are reaching out to bloggers to know what people think about our solution. I can provide you with a special bloggers login for an unlimited trial. Would that interest you?